The Akshaya Patra Foundation won the prestigious 14th Mother Teresa Award in the Best NGO category. The award was presented by Konijeti Rosaiah, Governor of Tamil Nadu at The Loyola College of Business Administration (LIBA). Every year, this award of excellence is given to corporates based on their CSR activities. Present on the occasion were also Dr.P.Srinivasan MD, Jeevan Blood Bank; Mr. N. Vittal, former Chief Vigilance Commissioner, Govt of India and Chairman Mother Teresa Award committee; Fr.N.Casmir Raj, Founder and President, LIBA; and Dr.T.A. Sivasubramaniam, Director, LIBA. The Best NGO Award is given to an NGO, which is trusted, respected and popular for their contribution towards social causes. 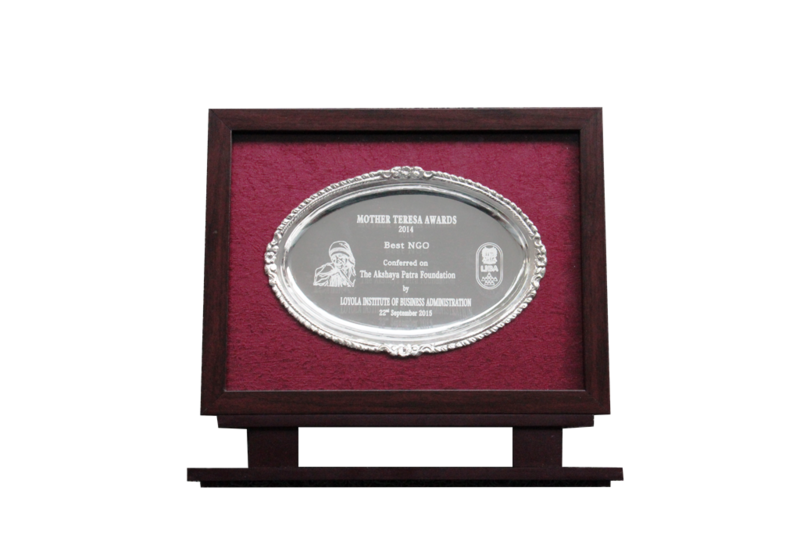 This honour was given to Akshaya Patra based on its contribution towards feeding children in India. The entrants were assessed not just based on their spending, but also on the history, commitment and impact of their CSR activities. The initial rounds of selection were conducted by a team of six researchers from LIBA who presented their findings to an esteemed awards committee. From this competitive list, a select jury comprising of experts chose the final winners of the Mother Teresa Award 2014 across several categories.